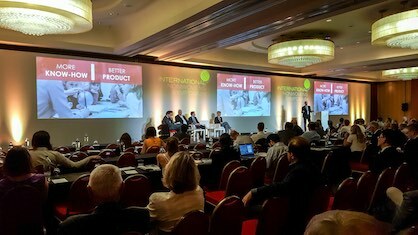 EDANA closed its 2018 International Nonwovens Symposium (INS) today, having confirmed the industry’s confidence in the opportunities and strengths of the nonwovens industry. A warmly received keynote presentation on IKEA’s global material sourcing strategy from Anders Bergner was followed with a very well attended session with enlightening examples of credible steps into the circular economy and use of renewable resources. "I thought the level of speakers and content, especially during the circular session, really gave the whole industry something to think about. The quality of participants was fantastic, with a really good mix of technical experts and senior executives” said Johan Berlin of InvestKonsult of Sweden. With a highly-praised table top display, and the traditional EDANA walking dinner, 215 participants from 144 companies across the supply chain took advantage of the many networking opportunities, discussing the variety of presentations from “Industry 4.0” challenges and opportunities, to recycling, innovation and new filter media. With further presentations on environmental sustainability and bioplastic material innovation, the 2018 INS delivered on the objective to address the challenges and opportunities facing the industry. Dayal Mehta from Welspun in India said that he believed the INS to be “the best forum worldwide for knowledge enhancement with excellent technical content. The great collaborative work between the EDANA team and attendees ensured each minute of the two days added value”.